Consider, once more, the writer as a soldier. Because Busch’s work dealt in covert ops, its unshowy aptitude saddled him with yet another label: “writer’s writer.” These stories are taught in M.F.A. programs because Busch’s fellow professionals appreciate prose that manages to be both moving and restrained, and they understand the risk involved in asking a reader to wring meaning from scant suggestion. Busch’s narratives provide the raw material, leaving the conclusions to us. Which makes you wonder if “minimalist” is just code for an author who trusts his audience more than most, just as “writer’s writer” simply means that not enough people have read him. I fell in love with Busch’s writing when I read Girls, where he managed to turn a dopey old dog into a lovable supporting character playing off a depressed campus security cop in a strained marriage. Read the stories “Extra Extra Large,” “Berceuse” and the aforementioned “Widow Water.” Then go out and read Girls, Sometimes I Live in the Country, and Too Late American Boyhood Blues. The New Yorker turns up a story written by Zelda Sayre—then a Montgomery, Alabama teenager, and soon to become wife to F. Scott Fitzgerald—for her high school literary journal. “The Iceberg” was written circa 1917 and concerns an unmarried Southern woman who, without her family’s knowledge, goes to business school and secures a job taking dictation for a multimillionaire, whom she later marries. For a slight story (just under 1,100 words) by a writer yet to reach adulthood, it is pointed in its messages about wealth, ambition, and status, and its themes, appropriately, speak of a spirited young woman looking to free herself from the hot, mannered South. Zelda did a good deal of her own writing during the early part of her marriage to Scott, before succumbing to breakdown (and the apparently stifling criticism, plagiarism, and likely envy on the part of her husband), and even published a novel, Save Me the Waltz, still in print as part of The Collected Writings of Zelda Fitzgerald. Marion Meade’s fascinating book, Bobbed Hair and Bathtub Gin: Writers Running Wild in the Twenties, gives Zelda a fair contextual evaluation alongside peers Edna Ferber, Dorothy Parker, and Edna St. Vincent Millay. Film was a running theme throughout Christmas this year, in terms of gift exchange. I got my wife the Alfred Hitchcock Masterpiece Collection on Blu-Ray, and she got me Matt Zoller Seitz’s exquisite The Wes Anderson Collection, a hefty full-color ode to the director’s entire oeuvre, with over 300 pages of commentary, interviews, and illustrations, along with scene breakdowns, allusions (there are tons), and influences, and a warm and laudatory introduction by Michael Chabon. This one will take me a while to pore through, and then I’ll want to watch all of the films again. Due to hosting obligations I felt somewhat on edge during much of the run-up to Christmas, and with many a cold night sure to lie ahead, I look forward to cracking into all of these. 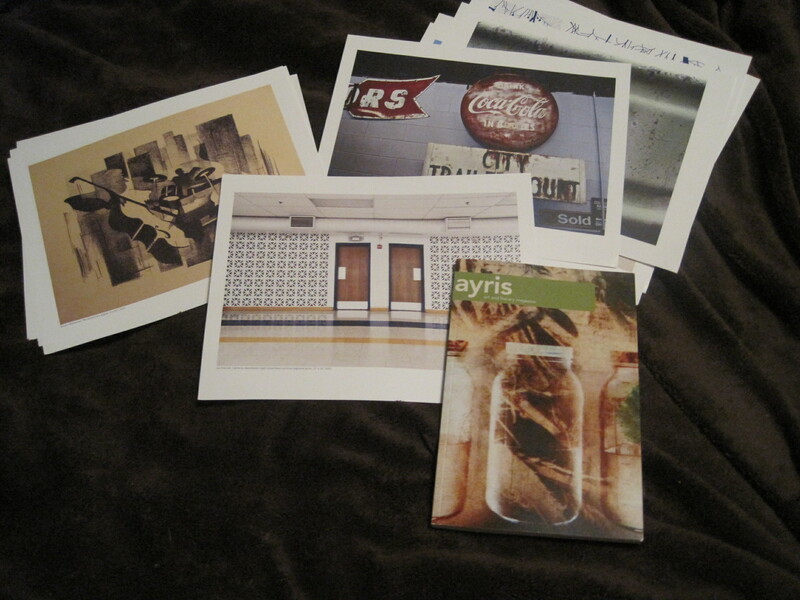 In the mail yesterday: Issue 03 of Ayris, the magazine of literature and art published by the New Hampshire Institute of Art. 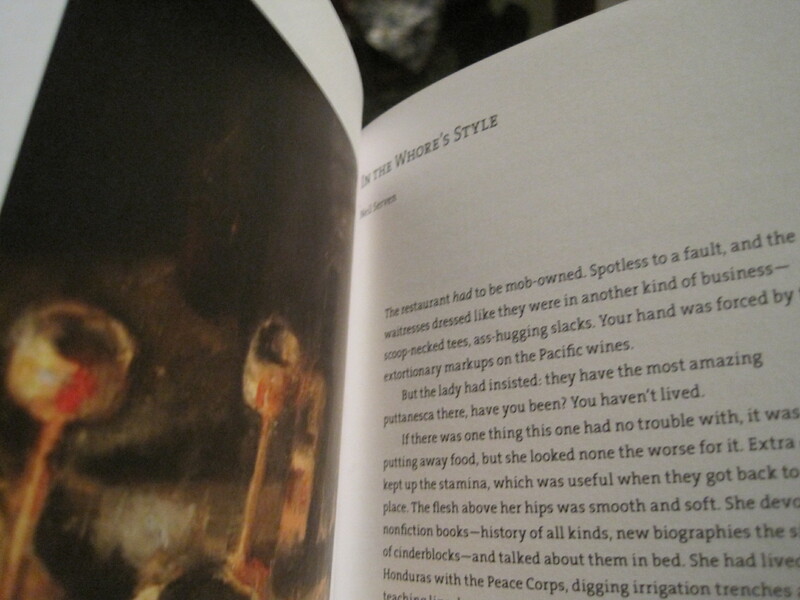 My story “In the Whore’s Style” is featured among an array of work by other talented writers. Nicely produced, I love the font choice, and the art opposite my story’s first page aligns well with the story’s themes. Also in the package: a bonus frame-worthy selection of larger-format art prints (pre-cropped versions of the images that appear in the magazine). Many thanks to past and present editors, Jenn Monroe and Ryan Flaherty. For writers, December runs hot and cold—a lot of rejection notices come in as the semester winds up, and a few acceptances, too. Everyone shares their end-of-year lists and nominations for prizes, like the Pushcart. I wasn’t nominated for anything this year, and I wasn’t expecting to be, but one editor did take the time to tell me that I was “a smidgen” away from making the cut for a Pushcart nod. Since it’s been a slow year otherwise, in terms of writing and publishing, it made me feel good for a few days, and I appreciated it. 1. Are you a good literary citizen? I don’t want to be overly prescriptive but while writing matters most, how we move through the literary world also matters. Literary citizenship is certainly not being disingenuous, uncritical, or falsely affirming about everything you read and every writer you encounter. Instead, literary citizenship can involve being a consumer as well as a producer of the written word. Subscribe to a literary magazine or two. Attend readings once in a while. Volunteer at a literary magazine. Do what you want, so long as you are doing something to contribute to the literary community, beyond simply offering your writing. Don’t burn bridges you may want to cross in the future. The writing world is as small as it is big; most everyone is connected in some way. Again, this is not to suggest you should be disingenuous but you never know when seemingly casual connections will end up leading to professional opportunities to participate in a reading series, or read at a university, or teach at a writing workshop. This has been on my mind lately as I make more friends and connections in the literary world. Social media tends to have a snowball effect when it comes to these things. I am connected to people—writers, editors, program directors—who don’t really know who I am, and I don’t really know them, but, as with any other field of interest, it is useful and rewarding to stay in touch with other practitioners, share ideas and frustrations about our choice of craft, and spread news about achievements and opportunities. But it is not lost on me that many of the people with whom I interact can also give me something I want. I want to be read by them, be published by them, be promoted by them and invited to read with them. I want to be mentioned in the same conversations as them. There is a fine line that must be trod in how I interact with them. When I submit a story to a journal, and then share a link to another story published in that journal while my submission is being considered, or like news of an editor’s book deal, am I greasing the skids? Am I complicit in a fraud if that action is interpreted as such? And if an acceptance or other opportunity were to come about from a journal I have promoted, or an editor whose work I have shared or liked, is it somehow less of an achievement if those interactions helped the editor or publisher to remember my name? I haven’t been submitting much lately, mainly because I have only a handful of pieces that are ready to see the light of day. But I have been sharing links, reading up on other writers’ career milestones and new projects, liking and encouraging as a way of staying abreast of what others are doing. In one way it feels like a way to participate in the conversation of writing, for lack of anything of my own to contribute. And it is always great to know talented and creative people. Having them close at hand, and paying attention to how they conduct themselves, can be a bit of a tacit, poor-man’s mentorship. But there are also times when it feels as though I am exposing myself, because for all the energy I spend fostering relationships with other writers I know I should be spending more on improving my craft. Earlier this week, one accomplished writer I follow and respect posted his list of favorite books of the year for The Millions’ Year in Reading, and the first commenter—anonymous, naturally—accused him of shilling for his friends. It was true, the writer admitted—a lot of the authors he mentioned were his friends. Some of them he had known for a while and others he had gotten to know only after enjoying their books. A few other commenters piled on, rather cruelly, accusing the writer of abusing his position as part of a circle-jerking enclave, which seemed to suggest a disdain not for the promotion of friends’ books but for the seeming impenetrability of that circle, a smugness among those who belonged to it, and the perception from outsiders that membership in that circle made it impossible to treat each other’s work with the same critical honesty expected in the writing community at large. On the one hand, this kind of accusation doesn’t say much; in any business, even one purportedly transacting in merit, one establishes a coterie of people one trusts, and those are the people one is naturally eager to work with. But I think there is also a responsibility to consider how things look from afar. The Internet gives writers a streaming, 24-hour opportunity to get their names in front of the people they seek to impress, and unlike the work of drafting, revising, critiquing and polishing, a lot of electronic networking takes place out in the open. We retweet, share, and like with no lack of awareness that we might be seen doing it and get paid back for it down the road. That’s only human nature. But it is also human nature to be cynical, and a writer who trumpets the work of another writer who has done that person a favor is going to appear disingenuous to some. Community is a valuable thing. I am very grateful for the many friendships I have made in such a short time since I started sending my work out. But true friendship needs distance and honesty at times, and I wonder if the Internet has made the writing community too snug for its own good. Via Atticus Books, the U.S. Department of Labor, of all places, in conjunction with the Center for the Book in the Library of Congress, is putting together a working list of Books That Shaped Work in America. It is fascinating to toggle through the titles compiled so far, which range in theme from the struggle to find one’s footing in industrial America (The Jungle, On the Waterfront; How the Other Half Lives) to portrayals of modern office hell (The Devil Wears Prada) to indictments of race and class warfare (To Kill a Mockingbird, The Help) to the science of labor and getting ahead (Studs Terkel’s Working, How to Win Friends and Influence People). Children’s titles are not forgotten, from Mo Willems to the MacGuffie Reader, nor are plays (Death of a Salesman, August Wilson’s Pittsburgh Cycle). A few are perhaps questionable: Peggy Noonan’s tribute to Ronald Reagan seems like a waggish commentary on the subject, and I have no idea how The Guinness Book of World Records fits into the conversation. Fortunately, it is meant to be a working list, and there’s a form for people to suggest their own additions. Microserfs, Douglas Coupland: one of the first office-as-cubicle-hell novels (a precursor to Joshua Ferris’s Then We Came to the End), perhaps not eligible since Coupland is Canadian. You are currently viewing the archives for December, 2013 at Neil Serven.